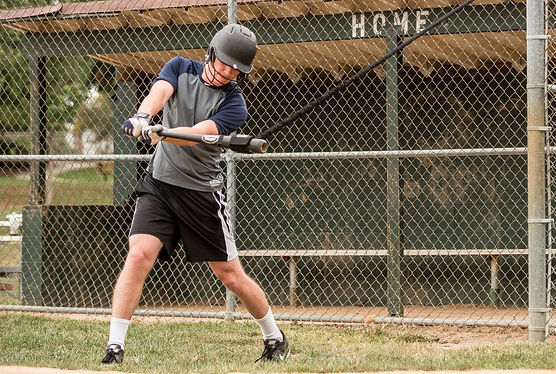 We all know that increasing your bat speed is the "holy grail" of hitting. How to do so? That's the tricky part. The 3S Hitting System takes a big picture approach. Instead of focusing exculsively on getting faster, it works on helping you become more efficient. That means moving beyond just building "fast twitch muscles," and thinking about which muscles need to be faster and stronger, and how your bat travels. Let's start with the path your bat travels. From here on, let's call it "Bat Path." If you want to decrease the amount of time it takes to get from one point to another, you have two options. You can expend more energy and move faster. You can also pick the shortest distance. If you do both, you're golden! In essence, that's how the 3S works. It's resistance tubing guides your bat along the correct path, while at the same time strengthening your hands and forearms. By combining strength training with bat path guidance, you naturally and quickly increase your bat speed. Extension Drill - Helps you develop the optimal swing path, or "slot." Blasting Drill - Continues working the "slot," but also forces your hands and forearms to work harder, making them stronger while building muscle memory. Rapid Fire Drill - Now it's all about your hands. If you can't feel the 3S working and improving your swing with this drill, you should already be in the Majors! Pepper Drill - Here you're shortening the motion even further, and working fast twitch muscles with the constant back and forth and resistance from the tubing. The other main component of the 3S is called the Swing Stabilizer, which wraps around your shoulder. While the Swing Blaster guides your bat and resists against your hands, the Swing Stabilizer works your core and helps teach proper hip rotation. While its main funtion is to improve power, the Swing Stabilizer also increases your bat speed. When you wear it in the "Overspeed" position, it will pull your torso through the proper rotation at a speed you would otherwise not be able to achieve. Over time, this action instills muscle memory and promotes flexibility. To learn more about the Swing Blaster, and how the 3S Hitting System will improve your power hitting, jump over to the "Strength" page. Now that you've seen how the 3S Hitting System significantly improves bat speed, check out how it also builds core strength and shows your hips how they should move to generate a more powerful swing. When you use the 3S to it's full potential, the results will shock you and inspire your teammates to want to learn your secret! Bill Dailey was formerly the 3rd base coach for the LSU baseball team, including during the 2000 National Championship season. Currently, he owns and operates Pitch by Pitch Hitting Academy in Baton Rouge, La. He created the 3S to help hitters of all ages and skill level reach their hitting potential so they can love the game like he does.